United Motor Services coach tours. Homepage. This page: A smart catalogue describing various coach tours on offer to private parties in the Sheffield area. 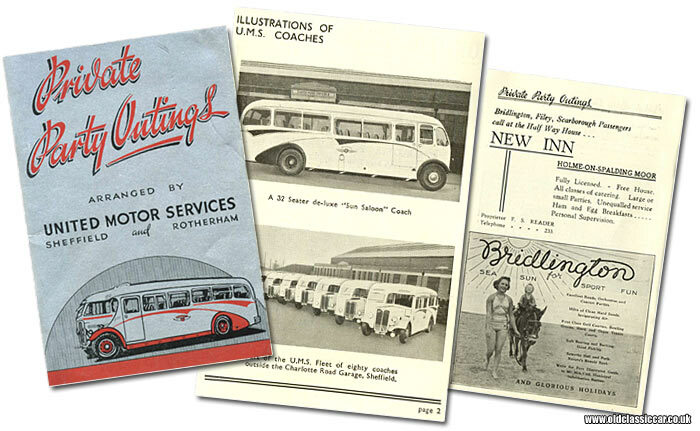 This guide to motor-coach tours from United Motor Services' base in Sheffield, is un-dated but I think must be from the pre-war years. Their Head Office was located on Charlotte Road in Sheffield - near to the Queen's Road Tramsheds apparently. Booking Offices were situated on Union Street, Pond Hill, Church Lane (Attercliffe), and Howard Street (Rotherham), the proprietors are listed as Sheffield United Tours Limited. UMS was one of several smaller companies that were combined into the SUT Ltd group in 1935, another being Hancock's Motor Tours, a 1939 tour guide for this company featuring at the aforementioned link. The booklet advises that the United Motor Services (UMS) fleet extended to some eighty coaches, and a selection of this fleet is seen photographed outside the Charlotte Road Garage. The nearest vehicle - which could well be a half-cab AEC coach - appears to be registered EWE 468, a Sheffield series first allocated to a vehicle in February of 1938. A second photo shows a side-on view of one of their smart coaches, referred to as a "32 seater de-luxe "Sun Saloon" coach." The tours described in this booklet are intended as suggestions and can, of course, be varied to suit individual requirements. The fares quoted are, we consider, very reasonable considering the high standard of the eighty luxurious "sun saloon" coaches which we operate. The fares are, furthermore, fixed by the Sheffield Motor Coach Owners Association. If, by chance, a lower quotation is received from an outside coach owner, we ask Organisers to consider very carefully whether the coach or coaches offered are as comfortable and as sound mechanically as those of the U.M.S. fleet and whether the other operator is in a position to supply replacement coaches in the event of a mechanical failure. We invite any member of the public to inspect our fleet and workshops at any time. The booklet then describes the many trips they had on offer - including day trips to Gretna Green, Whipsnade Zoological Park, North Wales, the Lake District, Stratford-on-Avon and Chester to name just a few. The booklet is peppered with advertisements for hotels, pubs, and eateries that could be visited during a day out on a UMS coach, and various destinations too are promoted within the guide's 64 pages. The ad for Bridlington sums up a typical British seaside holiday in the 1930's - a little 'un is shown enjoying a donkey ride, his mum strolling along barefoot on the sand. Glorious Holidays were assured, with tempting entertainments available to keep you occupied during your stay - these included orchestras, golf courses, tennis courts, boat rides and opportunities to go fishing. No mention of slot machines, kiss-me-quick hats or inflatable sharks in those days.. If lying on the beach or eating ice cream sounding a bit too exciting, then perhaps Tours nos 81 - 116 would have appealed? These were organised fishing trips, where you could spend your day sat quietly, alone, contemplating life while hoping for a catch. All UMS coaches were equipped with accommodation for fishing baskets and tackle, so at least there'd be no fishy odours to accompany the return trip home. More items of paperwork relating to motoring and motoring-related services can be found in the Motoring Collectables section. Various items relating to other coach operators can be found in this section, including items on Autobus coach tours in Cologne prior to WW2, a greetings card from London Coastal Coaches, and Macbrayne's. A leaflet from 1951 relating to United Automobile Services Ltd can also be found in this section of the site.